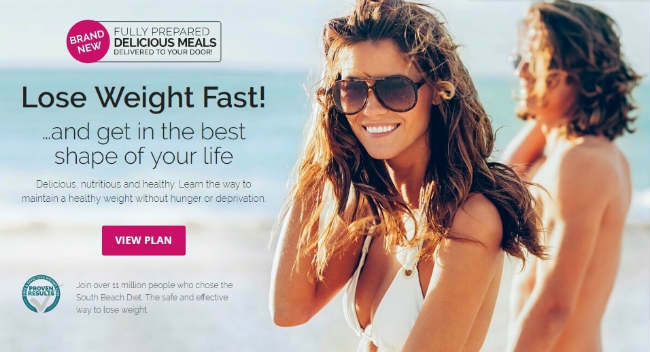 South Beach Diet Lose Weight fast with fully prepared, delicious meals delivered to your door? Dr. Arthur Agatston created the South Beach Diet in 2003, and many called the diet “a low modified carb diet.” The diets overall message, is that they will teach you how to eliminate the “bad carbs” from your diet all together. The book is based off the notion that the overall balance of good carbs, lean proteins, and healthy fats consisting diet will be sustainable and easy to follow long term. Foods with higher glycemic index levels are avoided as they can spike your blood sugar, and boost your appetite, which results in over eating. Quite simply, this diet is top of the popularity stakes because it promises great things. As well helping you lose up to a staggering 13 lb in just two weeks, it suggests you can also expect to lose most of that weight from your tummy. And who could resist a promise like that? 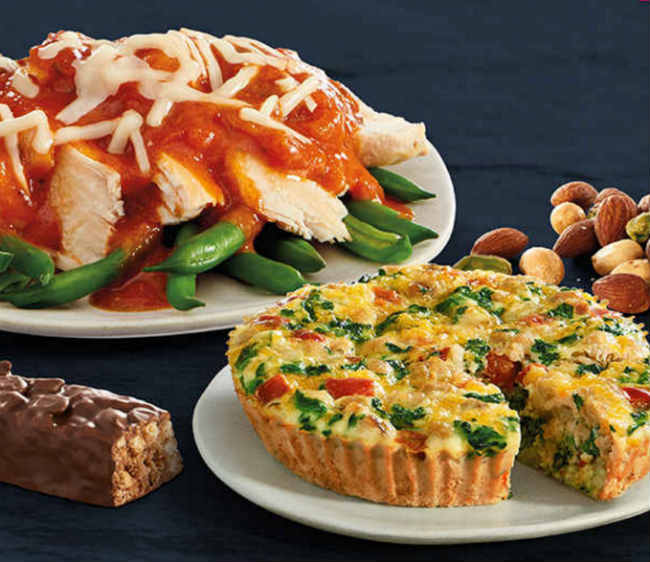 NEW way to Lose weight eating delicious, fully prepared meals you’ll love. Feel nourished, healthy and satisfied! Dr Agatston, a leading American cardiologist, originally created the South Beach diet for his heart patients. While his main aim was to improve their heart health, he discovered that as a side effect of the diet they also lost significant amounts of weight. He claims this isn’t a low-carb or low-fat diet – instead it focuses on eating the ‘right’ carbs and the ‘right’ fats. In fact, the South Beach Diet is based on the GI Diet. In practice, the diet severely restricts carbohydrates in the first two weeks, before gradually re-introducing those with a low glycaemic index. Plus it recommends swapping saturates for unsaturates. 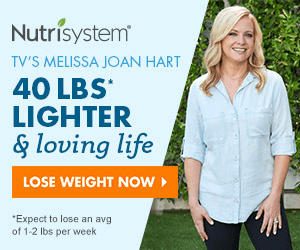 What’s the theory behind South Beach Diet? The South Beach Diet follows the same principles of other diets based on the Glycaemic Index. When we’ve eaten, the carbohydrates in food get broken down into sugars, which are then absorbed into the blood causing a rise in blood sugar. In response, the hormone insulin is released from the pancreas to remove the sugar from the blood. Carbohydrate-rich foods with a high glycaemic index, like bagels, cornflakes, white bread and jacket potatoes cause a rapid rise in blood sugar, resulting in the release of a large amount of insulin to deal with this. This causes blood sugar levels to drop rapidly, leaving you lacking in energy, craving more carbs and quickly feeling hungry so that you eat again. If this pattern is frequently repeated, you’re likely to gain weight as a result a constantly overeating. But on top of this, over time the body becomes resistant to the action of insulin and when this happens, the body becomes more effective at storing fat – especially around our middle! No surprises then that to lose weight, foods with a high GI are out! In contrast, carbs with low glycaemic index such as pasta, pulses and porridge slowly release sugar into the blood, providing a steady supply of energy and leaving you feeling satisfied for longer. This means you get fewer carb cravings, don’t constantly feel hungry and so are less likely to overeat. Plus there’s less chance that your body will become resistant to the effects of insulin with the result that it continues to burn fat efficiently. Foods with a low GI are therefore recommended if you want to lose weight. South Beach Diet Phase 1: This is a two-week phase that aims to completely cut out all refined sugars and starches from your diet. You are not allowed to drink any fruit juice or alcohol during this period either, as it is truly meant to be a detox phase. The focus is placed on consuming healthy fats, oils, and proteins.While no grains, fruits, or refined sugars are eaten, there are carbs in vegetables, which you can eat plentifully, and in dairy products which also are encouraged during phase 1. South Beach Diet Phase 2: This is a long-term weight loss phase that is meant to get you to reach your weight loss goal. You are allowed to slowly add in foods that were prohibited in phase 1 like starches and pastas (in moderation). You can stay in this phase until you reach your weight loss goals. South Beach Diet Phase 3: Once you have reached your weight loss goals, you can eat most foods in moderation. There are no restrictions in this final phase, because it is meant to be implemented for a lifetime. The idea is that in this phase you will have learned to eat healthier foods, and indulge in other foods only in moderation. What’s the story with fat? As you might expect from a cardiologist, the South Beach Diet certainly includes mention of fat. In fact, it recommends avoiding foods rich in saturates and and instead replacing them with heart-healthy monounsaturates like olive oil and nuts. So how do I follow it? Like many diets, the South Beach is divided into three phases. In Phase One, most carbohydrates are banned to give your body a complete rest from fluctuating blood sugar and insulin levels. The theory is this will help to resolve insulin resistance. During Phase One, the banned foods list includes bread, rice, potatoes, pasta, fruit, milk, sweets, cake, biscuits, ice cream, sugar and alcohol. A few low GI veg such as broccoli and cabbage are allowed, but the focus is on eating lean meat, chicken, fish, eggs, low-fat cheese, some nuts and olive oil. You follow this phase for 14 days. In Phase Two, low GI carbs including most fruits, Granary bread, wholegrain cereals and pasta and low-fat milk are reintroduced. The idea is to stay with this phase until you’ve reached your target weight. Finally, in Phase Three you introduce an even wider variety of foods. This phase is aimed at keeping your weight steady and the diet recommends you stay on this for life. The South Beach Diet claims you can lose 8-13lb in the first two weeks. Once you enter Phase Two, you can expect a more reasonable loss of 1-2lb a week. 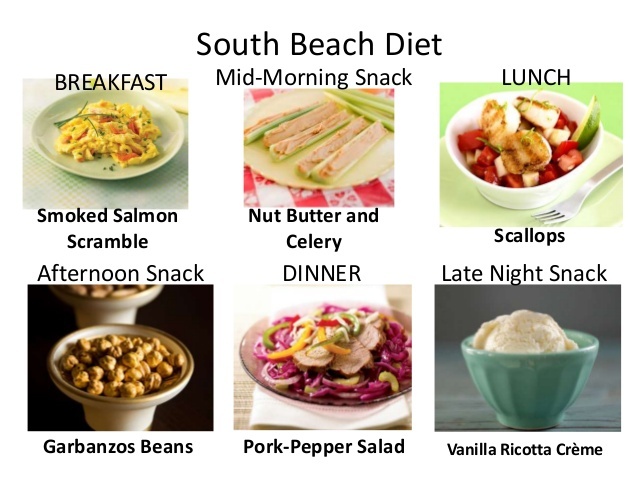 What are the pros to the South Beach Diet? In today’s dieting world where low-carb, high-fat diets are in vogue, it’s good to see a diet that recommends eating fewer foods packed with saturates and replacing some of these foods with heart-healthy monounsaturates. Diets based on eating low GI foods are also becoming increasingly popular and in general, encourage you to ‘de-junk’ your diet and cut down on carb-rich foods that are packed with few other nutrients such as white bread, sugary cereals and sweets. The extreme carbohydrate restriction in the first two weeks requires serious willpower and may leave you feeling weak and wobbly. Meanwhile, you won’t be getting your five fruit and veg each day during Phase One, which may leave you missing out on some vitamins and minerals. Eliminating all carbohydrate-rich foods during this phase also means you’ll be cutting out some other good sources of fibre, vitamins and minerals. For example, wholegrain breads and cereals are packed with fibre, B vitamins and iron, while milk is an excellent source of calcium and zinc. What do the experts think about South Beach Diet? Nutrition experts and dietitians are generally in favour of diets based on the Glycaemic Index, but while most believe in eating more foods with a low GI value, they don’t necessarily think all high GI foods should be banned. This is because the GI value of a meal changes considerably when foods are eaten together. That said, few experts would argue with a diet that recommends cutting down on processed carbs and swapping foods rich in saturates for those containing monounsaturates. Most nutrition experts are less happy with the recommended weight loss. General guidelines recommend losing no more than 2lb a week for good health and so experts are concerned that this diet promotes such a large weight loss in the first two weeks. They say this is unhealthy and is simply the result of a severe calorie restriction caused by cutting out all carbs. As for losing weight specifically from your midriff, most nutrition and fitness experts believe it’s impossible to lose fat from just one part of your body. Nevertheless, losing weight will almost certainly result in a reduction in waist size – and this is linked with a lower risk of heart disease and diabetes. The main difference is in the amount and type of fatty foods recommended. While the Atkins Diet advocates unlimited amounts of foods high in saturates such as cheese, butter and cream, the South Beach Diet recommends a diet that’s low in saturates. This means lean red meat, skinless chicken and reduced-fat cheeses are still on the menu, but foods like cream and butter are off limits. The South Beach Diet also places far more emphasis on monounsaturates such as olive oil. The Atkins Diet is also stricter in terms of its carbohydrate restriction, which even extends to limiting fruit and vegetables. In contrast, South Beach encourages a diet that includes fruit, vegetables and other low GI carbohydrates once you enter Phase Two. Final verdict on South Beach Diet? 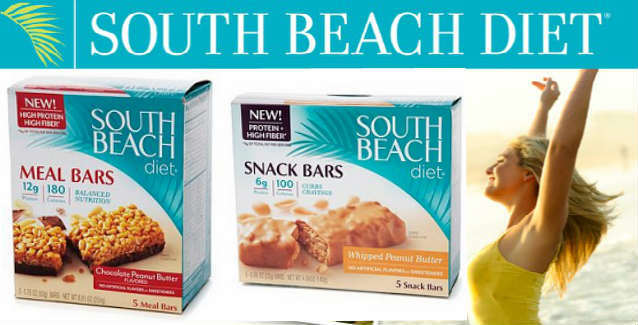 In general, the South Beach Diet only requires serious willpower for the first two weeks during Phase One. Nevertheless, this phase is extremely restrictive and the recommended weight loss of up to 13lb. While most of us would love to lose almost a stone in a fortnight, it’s not a healthy way to lose weight and unfortunately, it’s likely to go straight back on once you return to less restricted eating habits. And that’s not just bad for your waistline – but also for your moral! Once you get past the initial phase, however, there are fewer dietary restrictions than some other diet plans. No major food groups are eliminated, plenty of fruit and veg are recommended and generally the diet follows the basic principles of healthy eating with the result that it should provide plenty of the nutrients you need to stay healthy. I like diets based on the principles of the Glycaemic Index and South Beach certainly fits in with this (although I’m less keen on Phase One, which eliminates all carbs). Meanwhile, there’s no starving or fasting involved and it takes heart health into consideration. In the long term, this is one of the better diets – especially if you avoid Phase One and start on Phase Two. Nevertheless, it’s guaranteed to be a hit this summer with all the wannabe beach babes! Lose weight fast with fully prepared, delicious meals delivered to your door!